The Occitan room, located on the first floor, faces South and West and has an oeil-de-boeuf window and two windows overlooking the natural pool and the park. 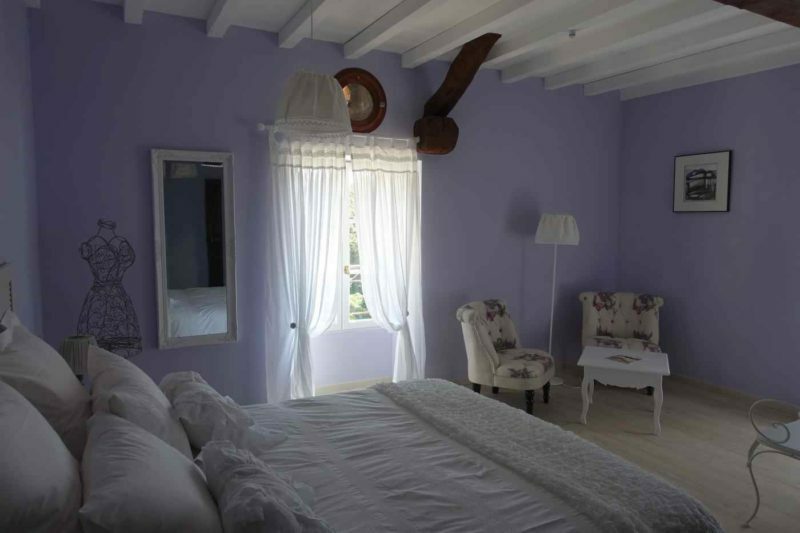 We furnished and decorated it in a country style, with lavender limed colours on the walls and old furniture which we sought, whitened and gave a patina. A romantic atmosphere which we drew inspiration in the memories of our grandmothers’ bedrooms. It is a room of 21 m², equipped with a high quality queen size bed (160 x200) with a naturel latex mattress from Biosense, with duvets and pillows from Fine Bedding (made of natural raw materials). The bathroom, lit by a light shaft, has an extra-flat shower tray, a wall-mounted toilet and a basin placed on a patinated piece of furniture. For your comfort, there is a hairdryer at your disposal and we provide an organic shampoo/shower gel in a dispenser. Book the Occitan room now!